Bill Windsor has not received any word from the Fourth Judicial District Court in Missoula County Montana since Friday's surprising hearing in the case of The World's Most Notorious Tweeter. That's me - Bill Windsor. Judge James A. Haynes is usually quick to issue orders, but nothing so far. I am expecting an order setting a new trial date. The hearing on Friday was surprising as Judge James A. Haynes put the State of Montana on the defensive by requiring that Missoula County Attorney Jennifer Clark file a brief to attempt to justify why there was never a hearing held on an ex parte temporary order of protection issued on August 23, 2013. If Judge James A. Haynes rules that the temporary order of protection wasn't valid because it expired due to no hearing (as I have been saying for years), then the charges will be dismissed. Missoula County Attorney Jennifer Clark had until 5 pm September 14, 2015 to file responses to my pending motions. She filed nothing. So, at 5:15 pm last night, I filed a NOTICE OF MOTIONS WELL TAKEN. 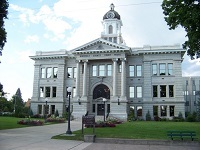 Montana District Court Rule 2(b) says the failure of the County Attorney to serve answer briefs by the deadline shall be deemed an admission that the motions are well taken. So, according to the Rules, Jennifer Clark just agreed that the charges should be dismissed. I wish she was ready to throw in the towel, but I doubt it. I continue to work on the first of my federal civil rights lawsuits. This one seeks to stop the prosecution because everything the Missoula folks are doing is UNCONSTITUTIONAL. LawlessAmerica.com has been down most of the day. No word from Iceland as to why. It went down right before we should have hit 1,000 Likes on the article summarizing where things stand. I understand we are over 1,050 LIKES and 7,000 SHARES. Thanks so much, everyone.